The watchdog for the Environmental Protection Agency late last week acceded to House Democrats’ demands that his office investigate the widely reported installation of a customized $25,000 soundproof booth in the office of Administrator Scott Pruitt. In a Dec. 8 letter to Rep. Frank Pallone, D-N.J., of the Energy and Commerce Committee, IG Arthur Elkins confirmed that questions on whether expenses for the booth for the privacy-conscious administrator “comply with appropriations law” are a legitimate project for the office to pursue. Elkins stressed, however, that other work and a tight budget leave him uncertain as to the timing of the probe. The IG just released its annual plan for fiscal 2018, which includes previously announced investigations into Pruitt’s travels and whether the administrator’s Protective Service Detail has effective controls to prevent time-and-attendance abuse. Pruitt, whose controversial changes at the agency have prompted death threats, has beefed up his security detail in addition to installing the booth designed to prevent hacking or wiretapping. He has said the privacy equipment is needed for his private calls with the White House and other executive branch officials. 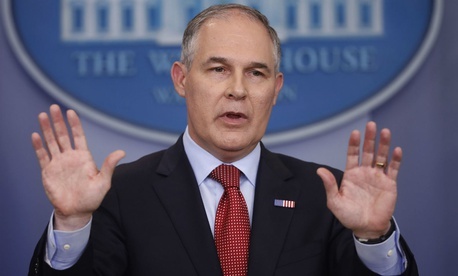 The booth was installed by a Richmond, Va.-based contractor called Acoustical Solutions, according to The Washington Post, and reportedly required an additional $7,978 expenditure to remove an existing closed-circuit TV to make room in Pruitt’s office.